It’s called Gresham’s law. It says that if you have two classes of money, one “good” and one “bad” and both are legal tender, the “good” money will disappear from circulation. We saw this in the United States in 1965 when the US Mint reduced the amount of silver in coins from 90% to 40%. If you were going to pay for something, and you had a silver quarter and you had a quarter with that copper line on the edge indicating it has less silver, which one do you use? Of course, you use the one with less copper. Technically both were worth the same amount. Gresham’s law is why counterfieters are pursued so aggressively. If counterfeit money was allowed to get any sort of quasi-legal foothold, it would quickly drive valid money out of circulation. So, what’s this have to do with my weekend? 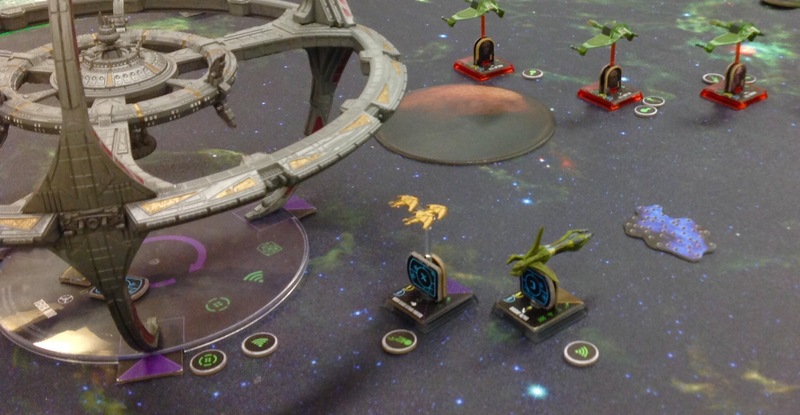 This weekend, two of my boys and I attended a Star Trek Attack Wing tournament. The game is really fun. You play on a desktop using miniture models of the ships from the Star Trek universe. So, you are playing as either the Federation, the Klingons, the Romulans, the Vulcans, the Ferengi. . .(There’s a lot of races and ships.) And what is the games biggest strength is also its weakness. I just recently started playing this game. My brother gave us some ships for Christmas and my boys and I really enjoy it. And honestly, I like the fact that it gets my boys to engage with me. When I looked for a game store that hosted games, I realized that Star Trek Attack Wing is losing popularity. It’s being replaced by X-Wing, a similar game set in the Star Wars universe. When you attend a tournament, you configure your own set of ships from the ones you own. While my brother has been very generous in sharing dozens of models with us, the cost of the game is not insignificant. Each ship costs $15. It’s not unheard of for someone to own dozens or even hundreds of ships. Each ship package comes with captain, crew, weapons, and technical upgrades. As a player, you are free to mix and match these cards to build the most powerful fleet possible. And that is the problem. And it’s also a version of Gersham’s law. Certain cards, of course, are more powerful than others. A Captain with a skill of 9 is more valuable than a captain with a skill of 4. In fact, unless he had some unique skills, you would never use the lower captain if you owned the more powerful one. As Star Trek Attack Wing became popular, it started to seperate itself into two types of players; brand new players who are just starting and have a few ships, and experienced players with dozens of ships. And the problem is that the beginning player has no chance against the experienced player. It’s not a matter of skill, it’s the fact that the experienced player owns hundreds of cards from which to build his fleet. The novice has a limited group to choose from and is going to lose. There are certain cards that are the ultimate cards. For example, there is a card for Captain Kahn, from the original Star Trek series. This card has a special ability that allows Kahn to match the highest captain skill on the board. People who own Kahn always play him. Like Tom Brady, he’s too good to leave on the bench. Kahn is a limited resource. New players don’t have access to him. Well, you can go online and buy the card for $125 on eBay. And so, the longer Star Trek Attack Wing continues, the worse the problem gets. As more cards enter circulation, the great cards will become part of the experienced players’ fleets. The strong will keep getting stronger. In the mean time, I’ll continue to enjoy playing with my boys, but it was a little disappointing to realize that it will become harder and harder to find tournaments to play in.